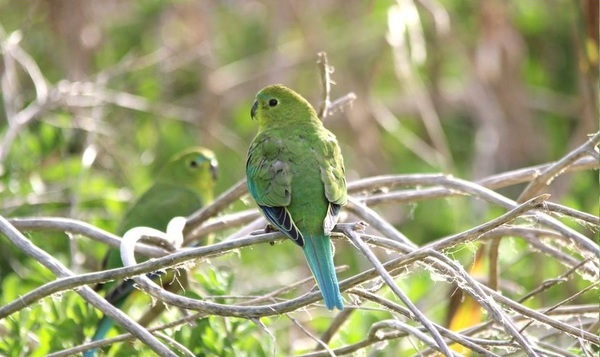 NATURE PARK: Wetlands at Moolap will be restored so the orange-bellied parrot and 27 other ecologically-significant bird species and various frog species have a long-term home. Ambitious plans to restore and protect critical wetland habitat at a former Moolap salt works have won a green light after years of lobbying. Environmentalists have welcomed the plan for Deakin University scientists to lead a research project to transform the existing wasteland into a bird-watching Mecca for international visitors. Scientists plan to rehabilitate 465 hectares of wetlands including RAMSAR sites and places of Aboriginal cultural heritage significance with a $590,000 Victorian Government grant. Associate Professor Peter Macreadie, who leads Deakin’s Blue Carbon Lab, said the funding offered “a once-in-a-lifetime opportunity to convert wasteland into wetlands”. Assoc Prof Macreadie said Deakin University was contributing more than $100,000, The Nature Conservatory $35,000 and Corangamite Catchment Management Authority $50,000 to the project at Moolap. Birds visiting the salt works site and surrounding marine and freshwater wetlands include one of the world’s rarest – the orange-bellied parrot – along with the critically-endangered curlew sandpiper, which flies from Siberia. Researchers will build fences to protect vegetation and undertake plantings to repair threatened saltmarsh and wetlands, providing essential habitat for 28 ecologically-significant birds and various frog species. “Our approach is to protect, conserve and restore the habitats that support the birds and other wildlife,” Assoc Prof Macreadie said. “Aside from the important environmental contribution this project will make, the site has potential to become a tourist mecca, with plans for an education centre, board walks and research hub. Geelong Environment Council’s Joan Lindros was “really delighted” with the project’s credible research partners. “It’s exciting to know Geelong is going to be the place for a bird sanctuary. Bird-watching is a big international market,” Ms Lindros said. The environment council, in conjunction with groups including Birds Australia and Geelong’s Field Naturalist Club, had hosted many public and inter-group meetings to discuss the future of the Moolap site, she said.